Apple's newest tablet or Apple's newest laptop? In case you weren't paying attention yesterday, Apple launched the super-sized iPad Pro tablet we've been expecting for months. With a mammoth 12.9-inch screen, you can turn it into a laptop with a keyboard accessory, or a graphics tablet with the new Apple Pencil. But where does that leave Apple's 2015 MacBook? Both are thin and light, both let you get work done on the go, and both have access to a bewildering number of apps. To help you pick a winner from these two new Apple products, we've laid out everything you need to know in the categories below. This is an area you probably don't need too much help with: the iPad Pro is a tablet with laptop pretensions (the Smart Keyboard is an optional extra) while the MacBook is an actual laptop (albeit a very thin and light one). Apple's newest slate takes the original iPad idea and runs with it to a screen size of 12.9 inches - it looks gorgeous in Apple's promotional images and videos, but considering the main benefit of a tablet is its portability, it may also have lost something vital along the way. Apple says the extra screen space is great for everything from movies to office applications. The MacBook's screen size is 12 inches, so slightly smaller than the iPad Pro, and of course the keyboard (and Force Touch-enabled trackpad) comes as standard. All the reviews of the device have praised its thinness, lightness and portability, so straight away it's edging into tablet territory, though the screen isn't responsive to touch. When closed, at its thickest point it's 13.1mm, which sounds chubby next to the 6.9mm thickness of the iPad Pro (though don't forget that's without the keyboard cover). Both are very stylish in their own way, and have Jony Ive's fingerprints all over them. The new A9X CPU that Apple has put inside the new iPad Pro is, according to the company, faster than the chips inside 80 percent of the laptop machines sold globally in the last 12 months. In other words: pretty fast. We don't know yet how much RAM is in there - 4GB is a good guess - but we do know the 12.9-inch screen runs at a resolution of 2,732 x 2,048 pixels (close to 5.6 million pixels in total). Unlike the MacBook, the iPad Pro has a camera (8MP) and there are also four speakers at each corner, designed to adjust the sound balance based on how you're holding the device. 32GB or 128GB of storage is available. By now you're probably reasonably au fait with the differences between iOS and Mac OS X. Apple's mobile OS sacrifices some functionality and flexibility in return for a streamlined, stable experience that's more suited to mobile devices and touchscreens. It isn't as powerful or as customisable as the fully fledged desktop OS that Apple produces, but for a lot of users it does enough, particularly with apps like Office for iPad now on the scene. iOS 9 brings with it a new Split View mode for running apps side-by-side, something that's sure to come in handy on the iPad Pro, and Siri is getting smarter all the time. On the OS X side, El Capitan is arriving just a few weeks after iOS 9 - it's not a massive upgrade over Yosemite but it's more stable and efficient, and you can do the same trick of snapping two windows to different sides of the screen if you need to. While power users will be more at home with Mac OS, iOS is closing the gap all the time, despite its limitations. You can't consider the iPad Pro without considering the Smart Keyboard, particularly if you're weighing it up against the MacBook. Clip it to the tablet and the iOS software adapts to hide the touchscreen keyboard and use the physical one instead (it doesn't have a trackpad, but iOS doesn't really need one). Then there's the Apple Pencil, a stylus that gives designers and creative types a new way of interacting with the tablet. As for the MacBook, it has just one USB Type-C port, but you can connect pretty much any laptop peripheral to it: you have far more choice than you do with the iPad Pro. As for pricing, the laptop is more expensive, with $1,299 and $1,599 models available; the iPad Pro will set you back between $799 and $1,079, but remember the Smart Keyboard ($169) and Apple Pencil ($99) are optional extras. Based on Apple's figures, both devices are pretty evenly matched on battery life. 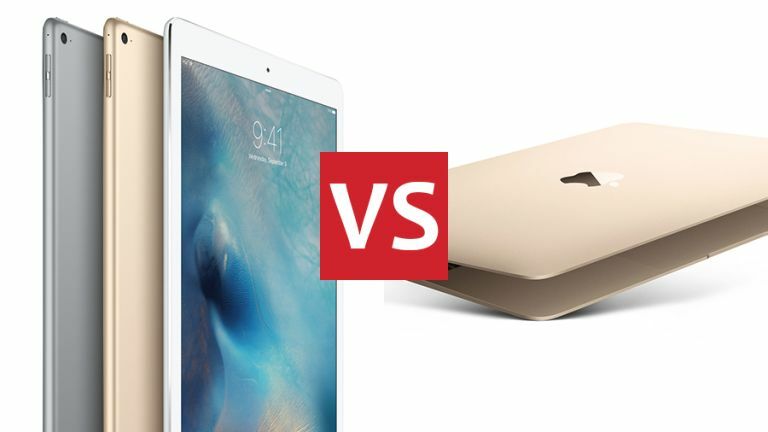 At first glance, the iPad Pro vs MacBook debate looks like a choice between a tablet or a laptop - but we're now at a stage where it's worth reassessing what that choice really means. Can you get all your computing done on a tablet with iOS? Do you need a keyboard and trackpad? Is touchscreen input useful? In many ways it's the tasks you need to do that will define your pick rather than the relative merits of these two Apple products.